A new blind safety device, designed to be the simplest, safest and most universal product on the market. Cord Lock Away is a child safety wand that uniquely raises the height of the accessible cord/beaded chain out of a child’s reach. Once fitted, the device remains in place and the upper region of the cord/beaded chain can be used to operate the blind in the usual way. Fits over continuous looped cords and chains including ones with cord connectors. Fitting the devices takes just a few minutes with a screwdriver provided. Cord Lock Away brings its safety benefits as soon as it has been fitted, but it can optionally be attached to the wall using the included wall holder. It is designed for all blinds with continuous looped cords or chains and comes in two sizes, one for windows and the other for longer windows, patio doors and conservatories. The device will also protect dogs and cats, who may become entangled in a looped cord after jumping up to a window sill. The cords and chains of window blinds can pose a serious risk to babies, young children, particularly those under the age of three who could strangle in the loop of cords and chains from window blinds. It is important that you take steps to make sure your children are safe. ensure all operating blind cords and chains cannot be reached by children. These tips should help to protect your child from possible serious harm. You should be aware that all risks cannot be eliminated. Parents and others should always keep window blind cords and chains out of the reach of children and follow the safety instructions. Using safety devices may reduce the risk of a child being strangled but nothing can be considered risk proof. You can consult a member of the British Blind and Shutter Association (BSSA) for advice on the most appropriate blinds for your home. They can also give you further information on ways to make existing blinds safer, alternatively send me an email and I will be more than happy to help! Before starting, decide whether you want your blinds in the recess or outside the window. For a neat fit that blocks out the light choose to fit your blinds inside the recess. For windows that are not straight or have lots of obstructions choose to fit your blinds outside the recess. This way you will be sure of a perfect fit for your blind. Width – Measure the inside width of the window at the top middle and bottom. Use the narrowest width measurement. Width – To minimize light leakage it’s recommended that the blind overlaps the window recess by least 50mm each side. Height – When measuring the height take into account the required space for the mounting bracket, a flat surface of a minimum 70mm is advisable. Measure in centimeters and round each measurement to the nearest 0.1cm. Look out for any obstructions such as window handles, tiles, dado rails etc and take their position into account if necessary. Curtains are a big investment, and so it’s important to make sure you get your measurements right. To avoid mistakes, I would advise you install the curtain pole or track before measuring for the curtains. When measuring don’t assume that any windows are exactly the same size, even if they look like they are. Measure each one separately and always use an extendable metal tape measure for accurate measurements. Take all measurements at least twice. For the best look and depending on space, your curtain track or pole should be positioned approximately 15cm (6”) higher than the window, and be wider than your window by 15-20cm (6-8”) either side. If you’re using a curtain track, measure its full width. If you’re using a corded curtain track, measure its full width including the overlap. This allows your curtains to overlap in the middle when closed. For curtain poles measure the width of the pole only, do not include the finials (decorative pieces on the end). If using a curtain track, measure from the top of the track to the required length. If using a curtain pole for pinch or pencil pleat curtains, measure from the small metal ring at the bottom of each curtain ring. This will prevent the pole or rings from being obscured by the curtain. Curtains lengths tend to be above the sill, below the sill or to the floor. The length that you choose depends upon the look you want to create plus other factors such as the positioning of radiators. For curtains to the sill, measure to 1cm above the sill. This will ensure the curtain does not drag. For curtains below the the sill measure 4″ to 8″ (10cm to 20cm) below the sill. However if you are choosing this length to avoid a radiator please adjust this measurement to allow the curtains to stop a couple of centimetres above the radiator. For curtains to the floor, measure to 1cm above the floor. This will ensure the curtain doesn’t drag. Always measure in at least 3 positions across the track or pole as floors and sills are rarely level. Use the shortest of these 3 measurements to avoid the curtains dragging across the floor or sill, unless you want them to “puddle” on the floor. For curtains that puddle, add 6 inches to the measured length. Need any further help or advice? Send me an email and I will be more than happy to help. 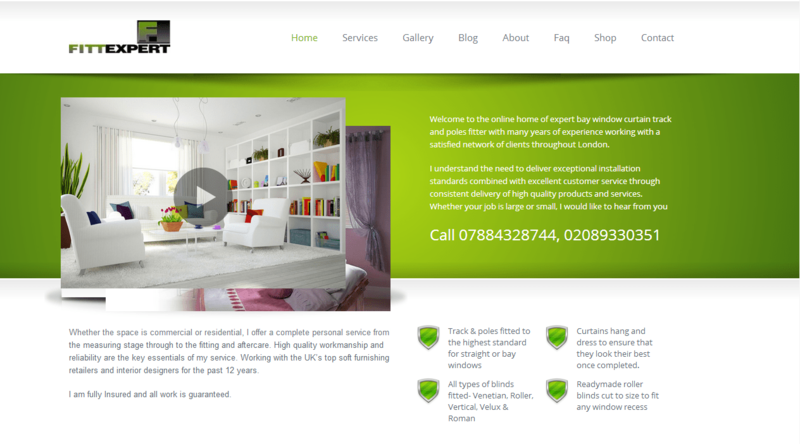 I are very pleased to announce the launch of our fantastic new website. Created with the user experience firmly in mind, Fittexpert version 2 has been designed using the latest technology, along with the new look I have included some features that I hope will make visiting the site a quicker, easier and an interactive experience. To make sure you get the most of the new website I have listed a few of the new features below. I hope you enjoy using the new website and would love to hear what you think about it – or let me know on Facebook or Twitter. I’ve refreshed the content and tied it all in with my social media activity, as well as introducing a fresher and more dynamic portfolio page to give you more of an idea of the kind of thing I love and enjoy doing. – Gorgeous User Friendly Design. – Ultra Responsive and 100% Mobile compatible. – Clean Valid HTML5 and CSS3 code. Please sit back and enjoy! I know how busy you are but if you have a minute, have a browse and see what you think. I’d welcome any feedback and thoughts.